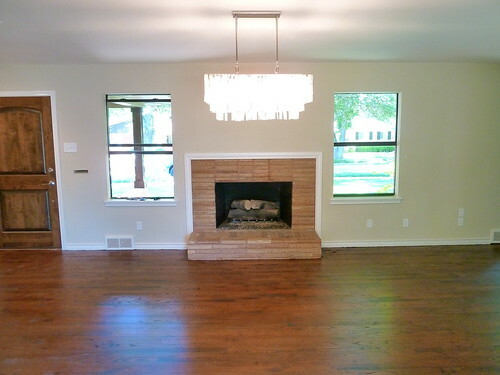 Luckily, it took just a little bit of time and paint for the fireplace to look all shiny and new!! 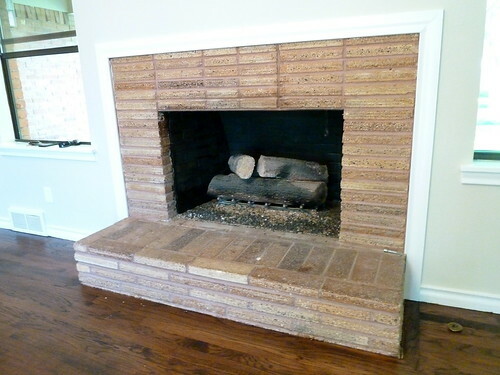 If the inside masonry of your fireplace is looking a little sad, here’s how you can freshen it up. 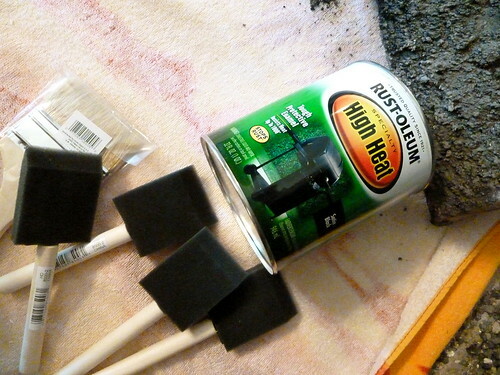 All you’ll need is some black high-heat paint, a cheap paint brush with bristles (I didn’t wind up using the foam brushes pictured below), and a towel to cover your hearth and act as a place to lay your logs while you paint the fireplace. FYI – the high heat paint is super stinky, so be sure to open all the windows and even wear a mask if you’re so inclined. This was a totally gratifying project, and super cheap and easy. Taken on any cheap and easy projects of your own lately? P.S. 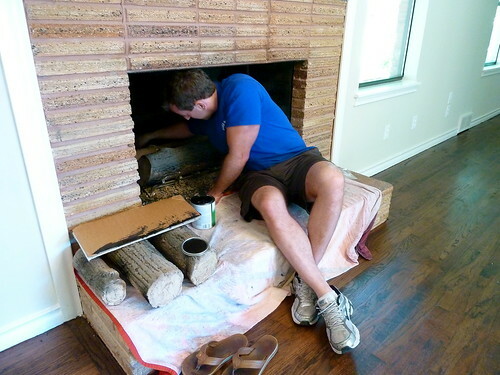 After you tackle the inside of your fireplace, why not check out these tips on how to paint the fireplace surround or spruce up the spark guard? UPDATE: A few readers have mentioned that Rustoleum does not recommend that this paint be used on the inside of fireplaces. 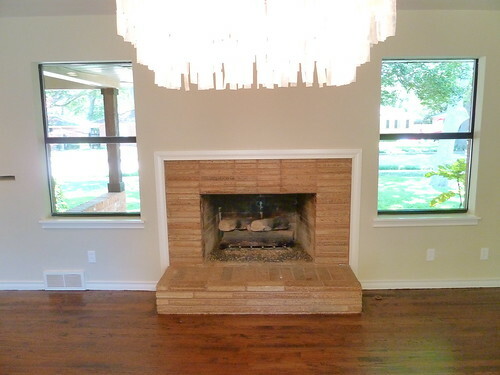 I haven’t had any problems with it (not even at our house where we’ve had many fires in our gas fireplace over the course of 4 years), but tackle this project at your own discretion! Ah – thank you for this! I had no idea that they sold high heat paint. The inside of our fireplace is looking pretty pathetic, so I’ve been wanting to paint it for a while now. I’m definitely going to be doing this soon! Great tutorial! Just the thing I need for our inside our fireplace. I’m a little biased, but she’s awesome!! :) We’re slowly getting our our routine down so the past week has been a lot easier – maybe by next week we’ll be sane people again, ha! You guys do such awesome work on your flips. I love seeing all the transformations. 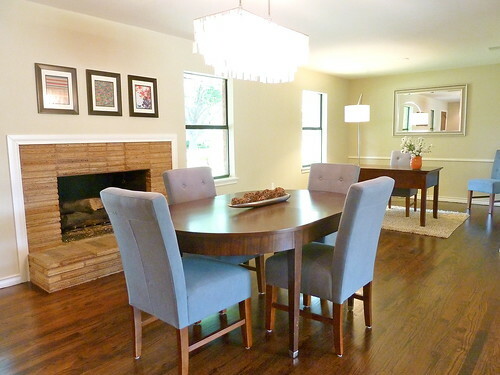 Do you have a FAQ for where all the furniture was purchased? I’m looking for a lamp similar to the one by the desk In the last pic of this post. Hi Kim! That lamp is an new addition from Z Gallerie – the sources for pretty much everything else can be found in the “Staging Sources” posts here: http://itsgreattobehome.net/our-second-flip/. Hope that helps! how is mommy hood going? how’s that sweet baby girl? i know you aren’t going to share photos or her name (i do the same thing on my blog and totally get that! ), but if you need any help – give me a shout out. i feel like i have been there done that with almost any and every baby issue. our kids are 7, 5 and 2 now…and i am still learning. but i so remember those first few months of getting to know my first baby and feeling isolated and tired and so in love – it’s a whirlwind of emotions, for sure. Hey Samantha, thanks so much!! We’ve been fumbling along okay so far but I know a time will come when I’ll have to call in the troops! :) I’ve sadly gotten used to sleep deprivation – it kind of feels normal now, ha! But she’s a total snugglebug so that makes me quite happy. :) Thanks for your sweet offer! That has really done it justice, it looks great now, I also didn’t know about high heat paint, good to know for the future, thanks! This looks great. Love projects that make such a big impact with a little elbow grease. Neat! What an easy fix, and looks so good!! Really great tip that completely changes the look of the entire room! I love reading about home improvements. These easy fixes are great to know for all homeowners! I am SO doing this to our wood-burning fireplace! Aside from sweeping and vacuuming the space out, did you use any chemicals or cleansers to scrub the brick before painting? Nope, we just went for it! 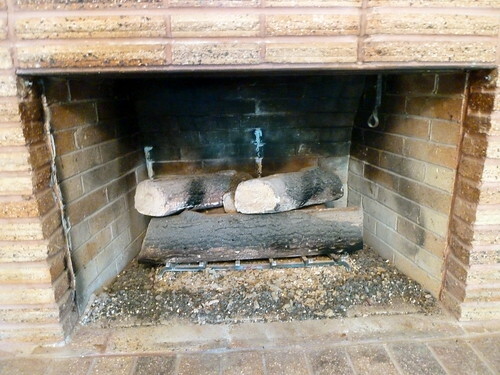 And in fact, we didn’t even sweep or vacuum it out – we just used a piece of cardboard as a shield when we got close to the fake “ash” that’s used under the gas logs. Call us rebels! It looks so much better afterwards, what a clever idea. I’ve never heard of high heat paint before, what a simple way to spruce up the room!